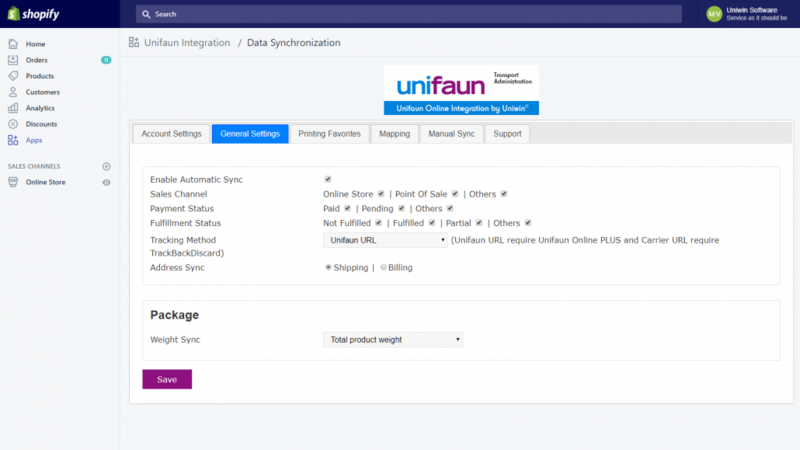 This Shopify Unifaun Web-TA app sync shipping details from Shopify store to your Unifaun Web-TA account. You can let the sync happen automatically and instantly when and order is received in Shopify store, or you can choose to control everything manually. 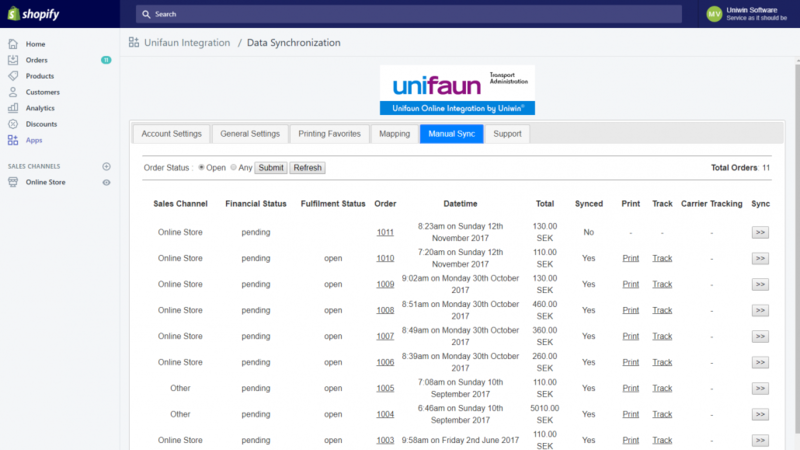 For each order in your store, there will be done XML posting into your Unifaun Web-TA account. The integration support all major transportation companies and all carrier services that are available in Web-TA. 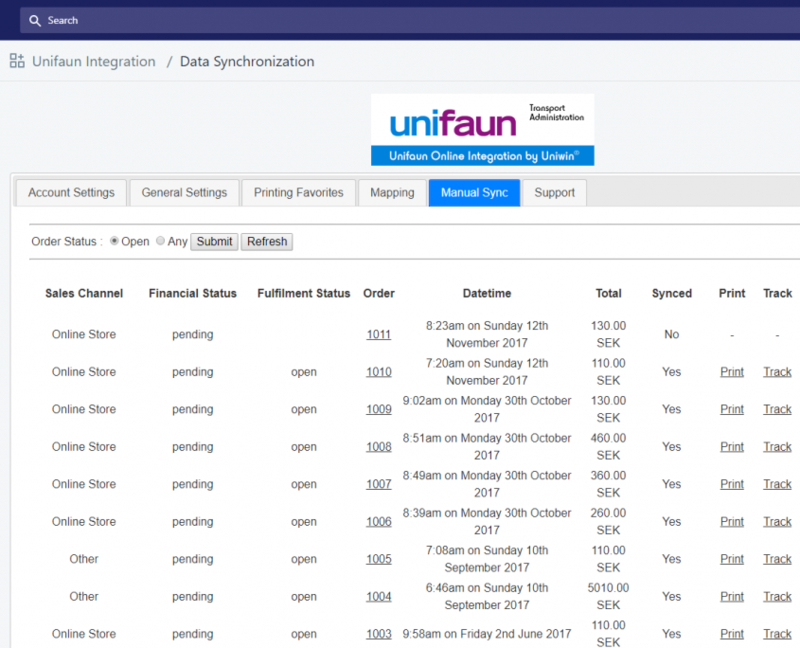 Supports multiple delivery agents simultanously, so each shipping option in your store can be mapped to different transport services. Enjoy! 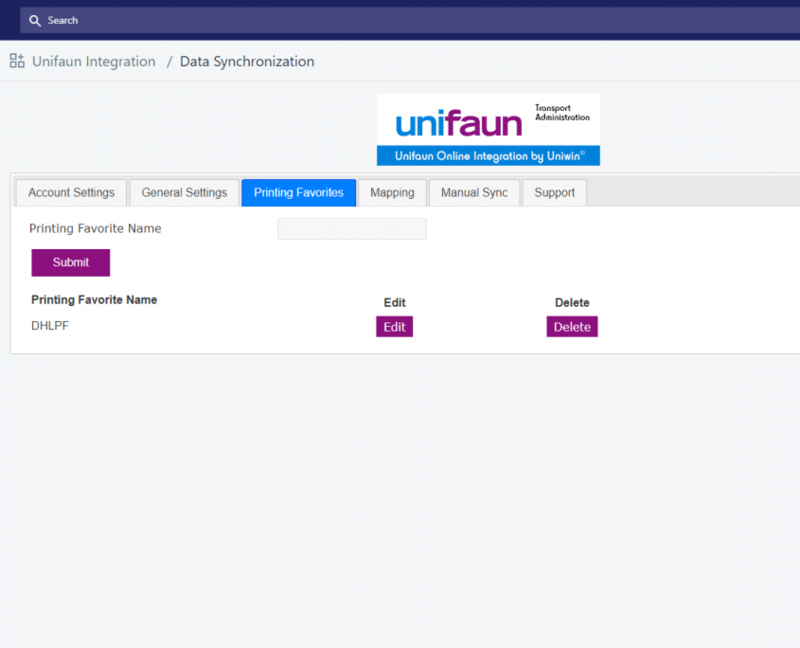 Unifaun’s integration addon. The start fee for this addon is 2900SEK and a monthly subscription 250SEK. 2. Sign up for Unifaun Web-TA account on https://www.unifaun.com/sv/transportkopare/unifaun-web-ta/ if you do not already have Web-TA. 3. 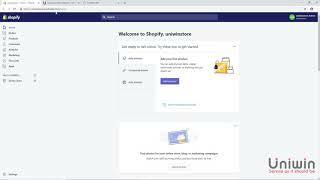 Login to your Web-TA account and order the Shopify integration add-on. 3. Connect your Shopify shipping option with Web-TA printing templates for Print Ready shipping label, or use simple mapping for getting started easier. Check our video guide. 4. Make a test order from Shopify. 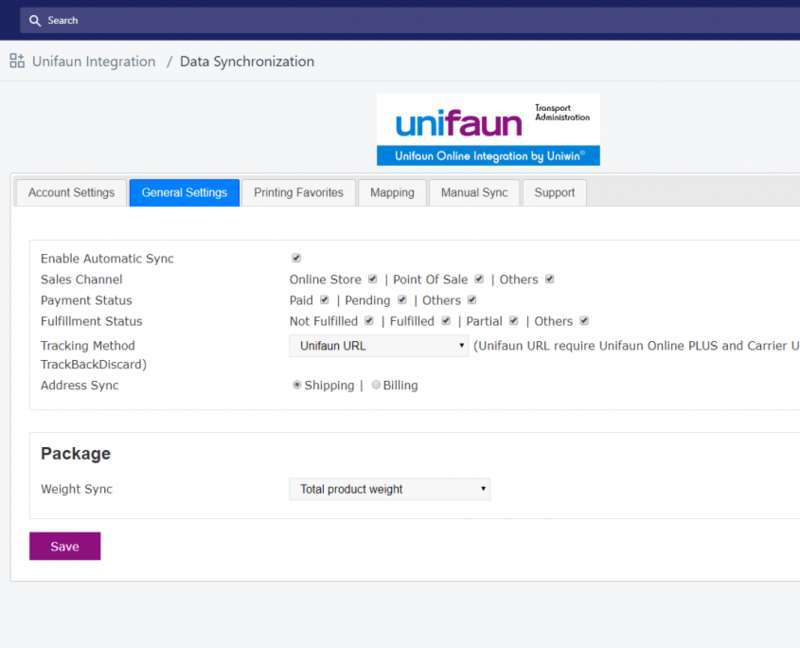 The shipping label will be created in Unifaun Web-TA immidiately. Good luck! Once an order is placed in Shopify store a shipping label will be created in Unifaun Web-TA immidiately. You can disable the Automatic sync and control this flow manually if you prefer that. Just go to Manual Sync tab and click on sync icon. 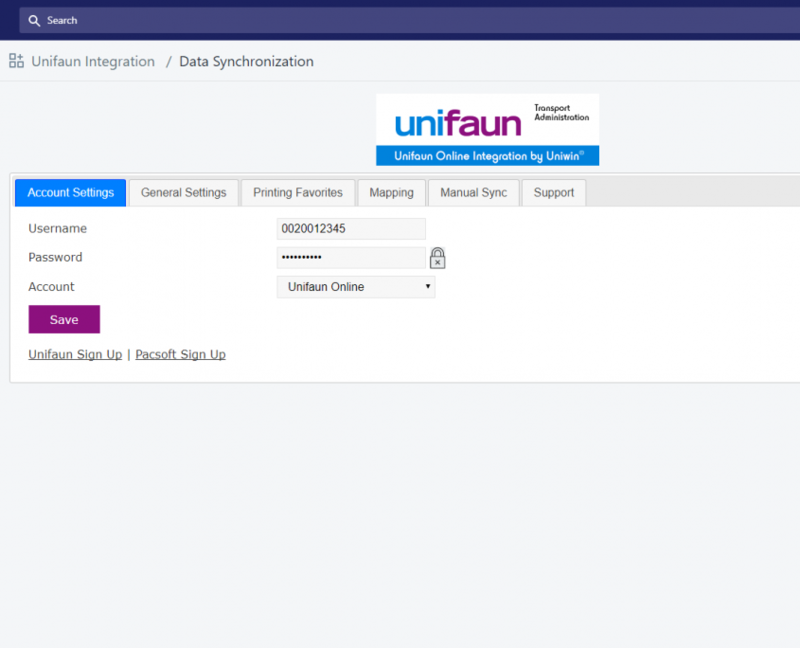 Tracking Link can either be Unifaun Link provided by Unifaun, or it can be Carrier Tracking Link provided by the carrier. You can select which one to retrieve into the app. The link will be available from the Shopify order. Type the installation url https://web-ta.eu/install.php in your browser and install the app just as any other Shopify App. Then select “Your Addons” in the main menu. The integration has a starting fee of 2900 SEK and then 250SEK monthly subscription. Which add-on do I need for using the sync feature? The addon must be enabled from without you Web-TA account and it is called “Shopify”. When you are inside Web-TA dashboard, just click on the menu named “Your Addons”, there you can click further. The addon has a starting fee of 2900 SEK and then 250SEK monthly subscription.